Recently, a posting on As the Garden Grows asked this question: Why do we garden? As I read, I mentally ticked off Tricia's points. Wanted to grow my own food... check. Enjoy the relaxation... check. There was something missing in her list, though. Something that motivated me but had not been named. As I tossed and turned last night, it finally came to me. I had to admit that part of the reason that I garden is to indulge my artistic ego. When I first started gardening, I was attracted to the idea of naturalistic gardens. I am very reverent about the beauty of nature, and also liked the idea of putting in plants that were well-suited to their surroundings and thus would not need much babying. In reality, I found "naturalistic" planting to be a huge letdown, and also somewhat of an inherent lie. The truth is, when we garden, we are not randomly and naturalistically planting. We weed out unwanted plants. We plan for aesthetically beautiful combinations and appreciate the occasional happy accidents. I believe that Piet Oudolf and Noel Kingsbury expressed my own feelings best in Planting Design: Gardens in Time and Space: "Strictly speaking, nothing that is made by people can be truly natural, and since gardens (unless they are simply enclosures of wild landscapes) are by definition human artefacts, it is perhaps misleading to speak of natural gardens." Gardeners make plantings that are more interesting, more beautiful, more understandable, more mysterious, Therefore, they are artists. All gardeners work with their hands, sometimes with the aid of a tool or with the protection of a glove but always with their hands. We use our heads, too, in planning out the sizes of beds or the spacing of annuals. And in diagnosing plant diseases and sussing out whether too much rain or too little sunshine is the cause of a plant's lackluster performance in a certain spot. And gardeners definitely use their hearts. Some plants we keep in the garden simply because they make us smile, or because they remind us of our roots or a certain special person. Sometimes our gardens break our hearts, whether ice storms cause tree limbs to fall or whether our own mistakes cause the untimely demise of a favorite plant. I see this childlike amazement at the natural world over and over again in various garden blog posts. Lisa over at Millertime constantly amuses me with posts that express her delight in everything from vermicomposting to raising fungus. Don (who I think of as Iowa Garden Boy) takes beautiful pictures of snowdrops and snow-mired winter grasses that non-gardeners would walk right by... and he posts them, too, for all of the rest of us to appreciate. And so many other garden bloggers experience and share their own childlike amazement in other ways as well. So, have I proven my case beyond a reasonable doubt? No court of law would think so. But I'm more interested in what my fellow artists--er, gardeners--think. Do you consider yourself an artist? Do you simply try to keep your flower combinations from clashing or are you driven to create particularly dynamic and exciting combinations? Do you copy the designs of the "old masters" like Vita Sackville-West, Gertrude Jekyll, and Roberto Burle Marx? Do you subscribe to a certain style of design, like English borders or cottage gardening, or do you prefer to be eclectic? Do you find yourself tending to stay with one type of plant (perennials, vegetables, shrubs, annuals) or are you fully into mixing your artistic media? Do any of these art analogies work for you--in your head and in your heart? Or do you think I must have delusions of grandeur to think of myself as an artist? I would love to hear your thoughts, either way. 1) Leaf through it page by page, checking out specific plants that catch my eye, careful to keep any drool from hitting the paper. 2) Start at the beginning and read each entry thoroughly. Appreciate some of Tony Avent's humor, roll my eyes at others of his jokes that aren't even a close miss. Circle plants that I would love to buy--to make this cut, they have to be a good fit for my garden both practically and aesthetically. 3) Go back through again, figuring out which plants I would actually buy at the prices listed--to make this cut, the plants have to actually have a specific opportunity (potential spot) in my garden as well. 4) Repeat step 3 until I have an order that is financially manageable. Right now, I'm only through step #2 so I thought it would be fun to tally up what I would be spending at PDN this year if my yard and my wallet were both limitless. You ready for the total? $1077. YIKES! Damn those cool hellebores. And toad lilies. And grasses. And cannas. And... well, let's just say that I must have good taste. And that Plant Delights (and several other places, like High Country Gardens) would love to have me as a customer if I ever won the lottery. 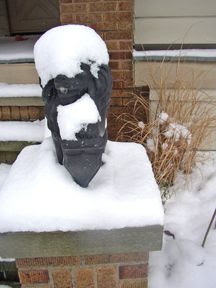 I have been reading with interest several web forum and blog posts about the issue of cleaning up your garden in the winter. Many gardeners--more than I would have anticipated--have confessed that they can't stand seeing dead plants in their garden at all. 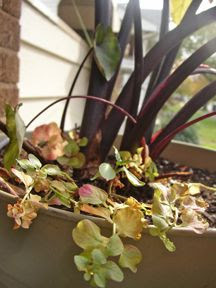 Some cut the plants down as they die, others do their garden cleanup in one fell swoop in the fall or early winter. On the one hand, I can understand this compulsive cleanliness. On the other, I really feel that neat-as-a-pin gardeners may be missing out on a whole lot of winter interest. "A plant is only worth growing if it looks good when it is dead," says Piet Oudolf as quoted in Noel Kingsbury's recent book, Seedheads in the Garden. He was apparently half joking, but why not at least leave up those plants in your garden that don't turn to mush at the first sign of cold? Especially if you live in a climate where a quarter or so of every year is taken up by the monotonous grey/brown/white of winter. 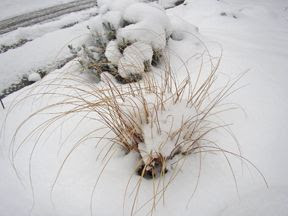 Dead plants -- especially umbellifers, like bronze fennel, and those with sturdy skeletons like tall sedums, echinacea purpurea, and eryngium yuccafolium -- can collect interesting dabs of snow on their dried seedheads and other horizontal surfaces. 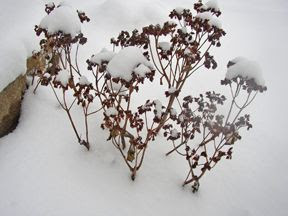 Thin, brittle stems and bunched dried flowers on a background of soft white snow can give the effect of a lovely ink drawing right in your garden. The worst plants to cut back too early, IMHO, are the grasses. 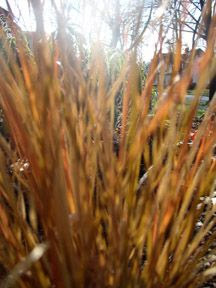 Unlike the stick-straight architectural plants, the grasses contribute much-needed movement to the winter garden. They always remind me of the life hidden beneath the snow as the tips of their blades move to and fro in the winter winds. Even those plants that are not much to look at during the winter... well, at least give you something to look at during the winter! I forget that I still have hollyhock foliage until the snow melts and the smallest of its rounded leaves pop jauntily back up into the air. I mentally tell the artemisia that it really needs a haircut when I walk past it, but I wouldn't want to cut it back in the fall and miss the way the melting snow falls through its fanned branches in small clumps. Check out this picture of my back garden bed. Had I cut back everything I was supposed to at the "prescribed" time, here's what would be left in terms of plant life: The rhododendron in the back, the beginnings of an espaliered firethorn against the wall, and the clump of kniphofia foliage in the front. As it is, I'm upset that I did cut back most of my bronze fennel, foxgloves, 'Hillside Black Beauty' bugbane, asclepias tuberosa, and verbena bonariensis. After checking out the gorgeous arrangements that Craig at Ellis Hollow put together this fall with the dead parts of such plants, I now have plans of my own. I can't wait to harvest dried material next October for a lush--but yes, very brown--Thanksgiving centerpiece. Leave it to Stuart down at Gardening Tips 'N Ideas to create a great new gardening blog directory. As if the clickable map that allows you to find garden blogs by geographic area isn't enough fun, he's built a garden blog search engine, too. I did a test search for "salvia" and was rewarded with pages of results. All came not from random webpages or plant retailers, but from the posts within the blogs that make up the directory. How cool is that? You can pick the brains of your fellow garden bloggers without having to interrupt their winter catalog dreaming or spring planting. The only thing that I can think of that would immediately improve this directory is the addition of more webpages. So if you're a garden blogger and you're reading this, click on over and get yourself added! One shortcut to this for U.S. bloggers: Stuart will ask for your latitude and longitude in order to properly place your little dot on the map. I found a free address verification page that will give you those coordinates once you type in your street address. For the record, I garden at 41.4727 Degrees North, 81.7919 Degrees West. 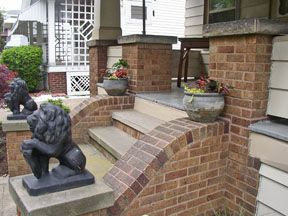 The first time I saw this house, my realtor and I both giggled at the lions "standing guard" on top of the pedestals at the base of the front steps. Front and center, they were the only bold, black features in a sea of brick, beige, and darker beige. 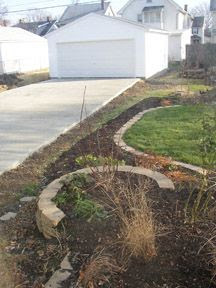 At that time, the small flower beds on either of them were buttoned up with retaining walls that were 2-3 blocks high. Combined together, the message conveyed was that this house (or at least its owner) took itself very seriously. I loved the house and bought it anyway, fully intending to remove the lions and replace them with something more welcoming. Abundant, overflowing planters, perhaps. The retaining wall blocks came down quickly and groundcover sedums took their place as edging. I realized that the lions were not going to be evicted as easily, however, when two very strong guy friends--one of whom would later become my boyfriend--couldn't even get them to budge. The lions may be relatively new to my house (according to one neighbor, they were put in around 2001) but they are fairly old. Based on the mark each one bears, they were poured in the early 1950s. I have a healthy respect for anything that is older than me, and a sledgehammer seemed like an unworthy end for such a noble guard anyway. So I did what any frustrated but sane person would do: I decided to ignore them until a good solution presented itself. The lions quickly became a punchline amongst my friends, who knew how much I disliked them. I was surprised when I realized this spring that new plantings around the lions have softened their presence and made them more livable. 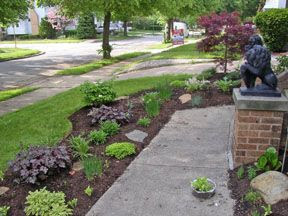 The addition of a bed in front of the sidewalk and the use of darker foliage in the front yard beds makes them take a step back visually. They no longer seem in-your-face in the way that initially irked me. I admit that I have lately gone to greater lengths to make these lions look more at home. Lions are obviously not native to my sandy shores of Lake Erie, so I am amusing myself by creating a little faux habitat for them. 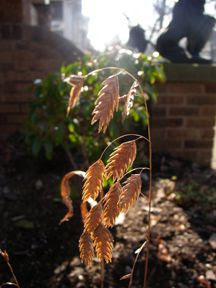 To anyone else, my front garden beds just happen to incorporate a bunch of funky grasses... but when I see the grasses swaying in the wind, I like to imagine that my lions are enjoying their own little piece of stylized Erie shore savannah. You might have already guessed that these guys are growing on me. In my defense, they have been invaluable in terms of directing people who are coming to visit me--not to mention how they help me find my own home on a daily basis. So while they still are not anything that I would have picked out for myself, and I am a long way from choosing nicknames for these guys... well, I am no longer plotting their demise or relocation, either. I will leave their ultimate fate to the house's next owner, whoever he or she may be. 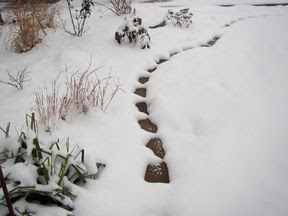 This isn't really a snowy path to nowhere, it's the edging of my garden bed. I took a picture of it before either I or the dog trampled the snow in the backyard to capture its peaceful, simple beauty. More snow-covered pictures to come... but not tonight. Tonight I am tired from a long, rough day at work, and tonight my boyfriend is home from a long, tough visit to New Jersey. Tomorrow is another day. I believe that my love affair with 'Rhubarb' Swiss Chard was pretty adequately documented on this blog, with many pictures posted of light playing through its thick, red-veined leaves. 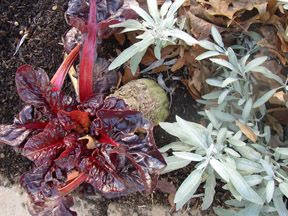 Swiss chard is a member of the beet family, which easily explains the thick root that you can see at the base of the plant in the second picture. In fact, it is a variety of beta vulgaris (the same species as the common beet) that was cultivated over the years specifically for the taste of its leaves rather than the flavor of its root. While researching Swiss Chard, I found quite a few named cultivars and mixes. 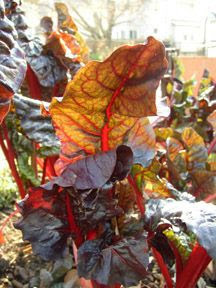 'Rhubarb,' 'Ruby,' 'Bright Lights,' 'Rainbow,' and 'Fordhook Giant' are all well-known names in the world of chard. It sounds like I'm a little fickle here, I know, but it really is a smart option. I love Swiss Chard sauteed in garlic and olive oil, with a little sea salt... but to me there is very little taste difference between Swiss Chard and beet greens prepared that same way. I know that I am going to be planting beets again this year, so why not branch out in the greens department? I find kale to have a very different taste. A few extra searches confirmed that I have to grow kale in my garden this year, if for no other reason than to enjoy the interesting texture it provides. Now the only question in my mind is this: From an aesthetic standpoint, which way should I go? Lacinto Blue? Or Redbor? Anyone have input on the aesthetic value of kale? Sometimes we all get blinded by the garden showstoppers--you know, the plants to which odes are written and for which admiration societies form. When I first started gardening, many of the truly lovely but comparatively quiet "workhorse" plants flew under my radar. Tiarellas were one such casualty, aided by the fact that an attempt at establishing a groundcover patch of tiarella wherryi in the shady side yard at my old house failed. As you can see from the first picture, 'Crow Feather' has interesting winter color. The purple blotches on the interior of the leaf turn darker purple, red, or reddish brown and the green outer leaf margins turn various shades of yellow through rust. If deadheaded regularly, they continue to flower intermittently through the summer and fall. 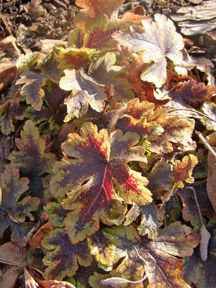 Other than deadheading, the only maintenance they need is the occasional deadleafing--similar to the treatment of heucheras. I will admit that I might be a little more vigilant about deadleafing the tiarellas, but that is only because I enjoy the scent of the leaves when they are crushed or pulled. It is very fresh-smelling, like celery and cucumber combined. My tiarellas were in their "creeping" year during 2006, so I expect to see some "leaping" out of them this year. They are even worthwhile in their slow years, however, so I hope to never be without them in the garden. How about the rest of my fellow garden bloggers? Any quiet plants that you love and want to give a shoutout to? With plants like these, it seems that they need either a cheerleader or a publicist to make a splash... and although I've adjusted my radar, I want to make sure I'm not missing anything particularly garden-worthy. While out taking pictures in my garden in December, I noticed some very disturbing areas of gumming on my young Bing cherry tree. I took a few pictures of the affected areas, and began to research. You know how it goes when you're researching diseases. First you have yourself convinced that you are looking at the worst case scenario. Then you go through a phase where you search for symptoms that would prove your ailment is something extremely treatable that can be mistaken for the more dire consequence. Time and even more research seems to bring answers. 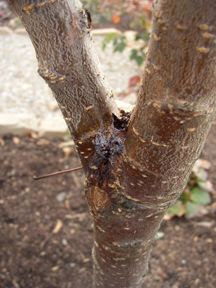 The more I read about bacterial canker on cherry trees, the more I became convinced that this is what is afflicting my Bing--not an "easier" problem like winter injury. The final nail was driven when I read about "dead bud disease," which is a manifestation of bacterial canker that causes buds to die back on the spurs in the spring. I saw that happen on this cherry (but only this cherry) in the spring of 2006, but had attributed the dieback to a very late freeze. I am pretty confident that this tree must have been infected already when I brought it home from the nursery in late 2005. Some sites say that you can cauterize the cankers to help kill bacteria that live on their margins, or even dig them out with a knife. I simply am not willing to do all kinds of spraying and babying when I have such limited space in the garden--even though both my Dad and I love sweet cherries, halved and frozen--so on the first reasonably warm day I will go outside and remove it. I do have two other cherry trees, one sour and one sweet. Neither variety is supposed to be as susceptible to bacterial canker as the Bing, and neither is showing any sign of disease. They both have resided a good distance from the Bing within my garden, so it is possible that both are still healthy. However, if I pull out the Bing I will probably pull out the other sweet cherry regardless of its health. I only purchased it in the first place to pollinate the Bing, and I really have no other place to locate a pollinator for it except for the space where the Bing currently resides. I am very leery of planting another sweet cherry there. Ideally, I will replace the healthy sweet cherry with another sour cherry, this one a larger variety than the dwarf 'Northstar' that I have. As for the spot where the diseased cherry was discovered, I'm still not sure. I think I need to go research elderberries, which I previously discounted for lack of space. Anyone know if the berries from those pretty dark-leaved sambucus nigra cultivars like Black Beauty make good jelly--or wine? You might remember me bragging about how I wrested an overgrown "dwarf" willow tree out of the ground with my bare hands (okay, and a pruning saw) this past summer. 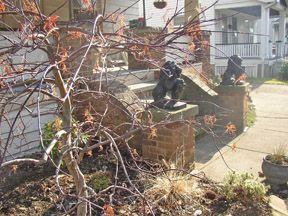 After it met its deserved end, I settled a newly purchased 'Diablo' ninebark in its place. Between then and now, the house next door was sold. I am going to be putting up a wooden privacy fence bewteen my house and this lot in the spring, so I didn't worry too much about what their plans would be for their backyard. I knew that the house had been slow to sell in part because there was no garage or other covered parking, but I figured that the fence would take care of hiding whatever was built in the backyard. Well... maybe not. This shot was taken out of my large picture window in the dining room. 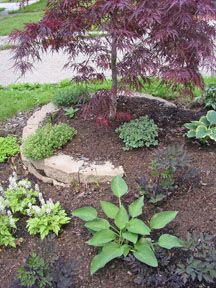 In the foreground you see the aforementioned ninebark, snuggled within the confines of a circle of retaining wall block alongside some hellebores and ajuga. When I am in the backyard at ground level, a 6ft. tall fence will provide plenty of privacy. When looking out my picture window, however, the stark white garage will be very distracting as it peeks over the fence. And peek over the fence it will--see the grey fence at the back of my lot for a height comparison. That fence is 6ft. tall painted spruce stockade. Luckily, all of this happened before the ninebark had much time to settle in. It will get switched this spring with the 'Northstar' dwarf cherry tree that is currently residing midyard and has a much taller (to 10ft.) and more upright form than the ninebark. It won't help as much during the winter, but during the colder months of the year I spend more time looking to the right, at my birdfeeder, anyway. Oh, and I forgot to mention the best part about the whole construction deal. The new owners are actually just flipping the house, and they have offered me the HUGE rock that was in their backyard as compensation for tearing up some of my grass while they put in the driveway and garage. The grass was frankly marked for death anyway, and I was trying to figure out a way to ask them if I could buy the rock off of them... so I am thinking that this is working out pretty well for me all around! Carol over at May Dreams Gardens posed a lot of interesting questions in her recent post, titled: "Seed Buying: Method or Madness?" There were too many questions for me to answer in a mere comment--after all, I can't even keep my regular posts under two screeens--so I figured they would be best addressed here. - Do you carefully read all of the seed catalogs sent to you and then browse the Internet to compare and contrast all the options, then decide which seeds to buy? - Do you order seeds from more than one seed company to save on shipping or buy from whoever has the seeds you want, even if it means paying nearly the same for shipping as you do for the actual seeds? - Do you buy seeds from ‘bricks and mortar’ stores and get whatever appeals to you as you are browsing? - Do you buy vegetable seeds in bulk where they scoop them out of seed bins, weigh them and put them in hand-marked envelopes? My answers to the above are: Yes, both, yes and... I wish! When I buy seeds from catalogs and Internet sites, I tend to be very careful and methodical. My credit card might eventually come out to finish off the sale, but it usually takes weeks if not months to get to that point. I make lists, research what I might want to buy and who offers the varieties I want at the best prices (shipping included) and then whittle the lists accordingly. If there is a plant I really want to grow and I know I can't find its seed locally, I will pay up as long as its total cost is still cheaper than buying the number of those kinds of plants that I want in the spring. In bricks and mortar garden centers, on the other hand, I can get into real trouble. 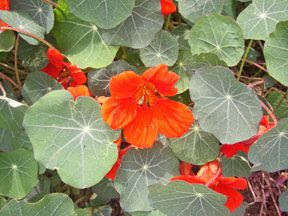 The pretty pictures, the choices... really, who can resist a whole half rack of different varieties of nasturtiums? Especially when you planted only red and dark orange varieties last year, and didn't realize how charming the buttery yellow ones were until you saw their pictures on the fronts of those packets? - Do you buy seeds for just vegetables, or just annual flowers? Do you buy seeds for perennial flowers? - Do you only buy seeds to direct sow into the garden or do you end up with flats of seedlings in any window of the house with decent light? In terms of buying, I buy seeds for everything--veggies, herbs, annual flowers and perennials. I haven't sown indoors or direct sown in the garden since I discovered winter sowing. I can winter sow a lot more seeds than I have room to start indoors, and I have more control over what goes where in the garden with winter sowing than I would with direct sowing. This winter, I am winter sowing crocosmia, echinops bannaticus, 'Apricot Sprite' and 'Apache Sunset' agastaches, winter hardy sempervivum, 'Wizard Velvet Red' coleus, stipa tenuissima and nicotiana sylvestris in addition to the usual suspects for the veggie garden. I would definitely not have the money to buy all of the plants of the above that I would like to grow--another benefit of winter sowing. - Do you list all your seeds on a spreadsheet, so you can sort the list by when you should sow them so you have a master seed plan of sorts? - Do you determine germination percentage for old seed? I wish that I had the discipline and organization to keep a spreadsheet, but I tend to rely more on intercranial information filing--which I admit isn't always the most reliable method. Maybe if I set up a spreadsheet this winter, however, I can do better at record-keeping this spring. I probably will not do much in the way of determining germination percentage for old seed, though, unless you count chitting and then planting the sprouts. I never seem to have enough of old seed to just test a sample, and I would feel badly about wasting sprouted seed. - Do you save your own seeds from year to year and exchange them with other seed savers? - Do you buy more seeds than you could ever sow in one season? 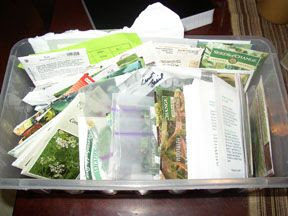 - Do you keep all the old seeds and seed packets from year to year, scattered about in various drawers, boxes, and baskets? I saved seeds this year for the first time, from 'Pride of Gibralter' cerinthe, digitalis parviflora, and cimicifuga/actaea. I would like to save more this year, particularly if I find some good-tasting plum tomatoes. As far as buying more seeds than I could ever sow in one season and saving packets from year to year... yeah, guilty as charged. Check out what a wreck my seedbox is, and it was just cleaned up this fall! 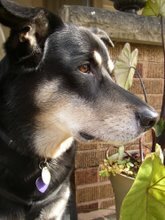 I donated a bunch of extras to fellow gardeners and a couple of gardening newbies. I also talked myself into throwing out seeds older than 2002--more because I figured that after 4 years it was safe to assume I would not bother planting them than because of any concerns about viability. - Do you know what stratification and scarification are? Have you done either or both with seeds? - Do you have a fear of seeds? Some gardeners don’t try seeds, why not? - Do you understand seeds? I once bought seeds at a Walmart in January (Burpee Seeds) and the cashier asked me, “Do these really work? Yes, they do. 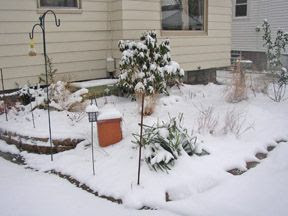 “Isn’t it too cold to plant them now?” Well, yes, if you are planning to plant them outside. I don’t think this cashier grew up around anyone who gardened. I can define the processes of stratification and scarification, and have done both. I have no fear of seeds--but then I have no fear of any aspect of life, including death. I guess that you could say that yes, I understand seeds... but I do have to admit that I don't want them to lose all of their mystery and magic, either. I love knowing the science behind them, but would like to always appreciate the small miracle that every seed contains as well.